Great work indeed,,, any updates soon? Seems lije the 2008 nodel has less repairs? I notice the 2004 Prius has fewer repair trips/yr than any other vehicle that old except for the 2004 Lexus RX among TrueDelta's statistically significant stats. Next update is next week. The hard part with older cars is that at some people start living with problems rather than fixing them. When comparing cars of the same year this should cancel out. I have noticed that the only cars reliable for 10+ years are either Hondas or Toyotas (and not all of these). The Prius is a reliability champ. We have more people selling than buying cars of this vintage, so additional participants--for any year--would be very helpful. We've updated our reliability stats for the Prius to include owner experiences through September 30, 2014. New stuff this time. We've updated our reliability stats for the Prius to include owner experiences through the end of 2014. Plus we've added reliability trends graphs. These indicate how a model's reliability has changed as it has aged, and how different model years performed when the same age. To view the new graphs, select "reliability trends" in the breadcrumbs at the top of the linked page. Or check out the attachment. The second-gen Prius does have unusually flat trend lines. The new reliability trends graphs are great! They will improve as you get more years of data. I'm glad you like them. Like the stats on which they're based, these graphs are most precise with large sample sizes. We've got fairly good sample sizes for the Prius, but they could be better. So I hope more owners will join. Okay, not much change from...ever. Boringly consistent! Next updates in August and November. We've updated our reliability stats for the Prius to include owner experiences through September 30, 2015. There seems to be a sudden spike in repairs for 2004 models. It will be interesting to see in the future if this is an anomaly or if the 11 year mark becomes a "magic number" of sorts where GenII Prius parts begin to see more failures. We've updated our reliability stats for the Prius to include owner experiences through the end of 2015, about eight months ahead of other sources. We've updated our reliability stats for the Prius to include owner experiences through June 30, 2016. Reliability information elsewhere is based on a survey conducted in April 2015--well over a year ago. Has anyone seen a 2008 put a rod through the block? Got a call from my mom that she was broken down and picking up what she believed to be pieces of her car on the road. sounds like situations i've had, but those were highly modified, forced induction cars. i understand anything can pop if ignored long enough, but do these really grenade without noise from a spun bearing first? Just have a hard time believing the prius throws rods like a dragster. She felt she "may" have ran over something, just trying to get some ideas from the experts before i check it out. Thanks for your input. i will be happy to contribute to the thread once i can confirm a thrown rod and have all the other details you would need. We've updated our reliability stats for the Prius to include owner experiences through September 30, 2016. Chodronish, nssdiver and StephenJ like this. I traded in my 2008 last month and removed it from true delta and put my new 2016 on. 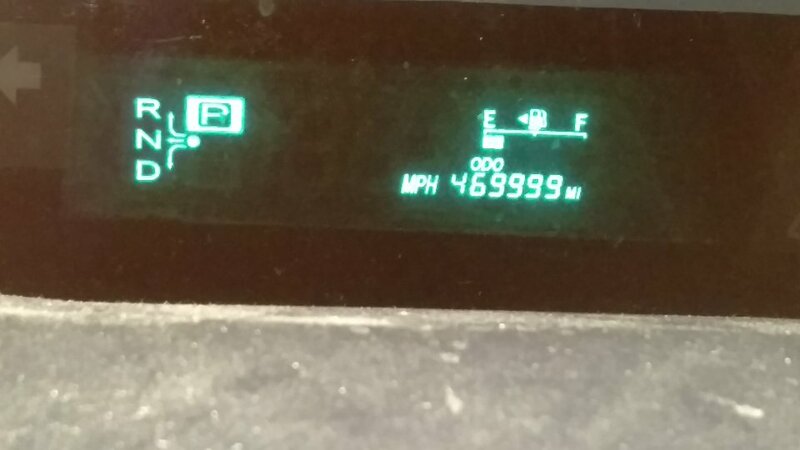 I only had 108,000 on the 08. It was the best car I ever owned and only three trips to the dealer and two were for recalls and the other was those troublesome HID light for bulb replacement. Mine was the only one I ever saw with rust on the right rear rocker panel. I blame that on where I worked in a steel mill, very corrosive atmosphere. Mechanically, I replaced the noisy right front wheel bearing and replaced front struts at close to 100,000 miles. I am expecting similar results from my new 2016 Prius. Wao! This is great. A job well done. I'd like to incorporate something like this in Nigeria, where we've got lots of issues with used cars. I have have PM you already @mkaresh.